It was another over-capacity crowd in Nashville as 17,355 watched one of the most exciting games of the season. In a game that saw seven goals in the third period, with four in the final three minutes alone, Predators fans were sent home cheering on a 7-5 over Central Division foe, the Chicago Blackhawks. We spoke with Nick Spaling, who earned time on both the power play and penalty kill, following the game. Game recap after the video. It was early in the first period when the Chicago fans began to cheer. After an odd bounce off the sideboards, Brandon Saad found Ben Smith, who fired it past goaltender Pekka Rinne at 4:11. The goal was Smith’s 14th on the season. Just a few minutes later, head coach Barry Trotz called a timeout at 6:59 to calm his team down after being completely dominated by the Blackhawks. Half way through the first period, Nashville was still having difficulty generating any sort of offensive opportunities as they only mustered one shot on goal. At 12:43 of the first, the Blackhawks increased their lead to 2-0. Marian Hossa streaked in, beating Gabriel Bourque, and swinging around the net to complete the wraparound attempt on Pekka Rinne. Just 16 seconds later, Craig Smith got one back on just the second shot of the game for the Predators. After winning the face off, Smith sniped it past Raanta for his 22nd of the season. Smith’s goal ignited the Nashville fans, generating a true playoff-like atmosphere. The goal seemed to settle the Predators down a bit as they were able to hang on and finish the period only down 2-1. Nashville gave Chicago a chance to increase the lead back to two when Ryan Ellis tripped Peter Regin at 3:12. The Blackhawks generated a few opportunities, but the Predators killed the penalty. Less than a minute after killing the penalty, a beautiful series of passes led to a Ryan Ellis goal. 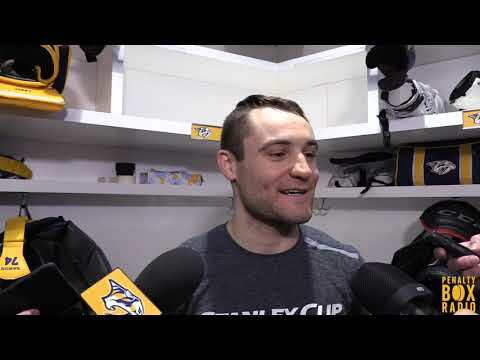 Patric Hornqvist dished it to Mike Fisher behind the net, who then found Ellis in the slot. Ellis then fired a bomb of a slap shot past Raanta to tie the game at two. At 7:04, Nashville went to the power play. Michal Rozsival cross checked Patric Hornqvist to give Nashville its first power play attempt. Chicago interrupted passing lanes and only allowed a one true scoring opportunity, killing the penalty. Chicago was put on the power play again when, midway through the second, Seth Jones tripped Jeremy Morin. The penalty kill was excellent and even created a shorthanded scoring opportunity when Shea Weber found Paul Gaustad for a shot that was saved by Raanta. Following the end of the penalty, the Blackhawks regained the lead when Matt Carey recorded his first career NHL goal. Brian Bickell was behind Pekka Rinne and found Carey in front of the net, who then zipped it in for the goal. Late in the second, the Predators were given another power play opportunity. In his first game back after serving many as a scratch, Michael Del Zotto drew a cross checking penalty against Kris Versteeg. Even though Chicago killed the penalty, Nashville had many tremendous chances to score. To close out the second, the Predators actually took the lead in shots, 17-13, but not on the scoreboard, as they trailed Chicago 3-2. The third period was a scoring clinic for both teams. To begin the onslaught, Nashville scored two goals to take their first lead of the game. The first, at 4:03, was scored by Matt Cullen when he stuffed in a rebound off a Mike Fisher shot. The Cullen goal gave him 600 career points. The second, a Frosty goal, was another rebound goal. Colin Wilson batted in the puck off a Shea Weber shot at 7:05. The goal was Wilson’s 11th. Chicago also wanted to join the party and at 8:00 of the third, Jeremy Morin tallied his 5th goal of the season to tie the game at four. Assists on Morin’s goal came from Johnny Oduya and Andrew Shaw. Another power play opportunity was given to the Predators at 11:18 of the third. The Blackhawks were called for too many men on the ice. Chicago interrupted multiple passing attempts, cleared the puck well and killed off the penalty. The last three minutes were some of the most exciting minutes of hockey to watch. At 17:05, Paul Gaustad notched his 10th of the season after receiving a pass from Craig Smith behind the net. Just 1:20 later, the Blackhawks scored with a tally from Andrew Shaw to bring the game back to a tie at five each. With just under a minute remaining in the game Matt Cullen found Patric Hornqvist with a centering feed where he tipped it in for his 22nd goal on the year. After this goal, Chicago went with the empty net. Shea Weber capped off the last game at home with an empty net goal shot from behind the red line in the defensive zone and you have to see it to believe it. 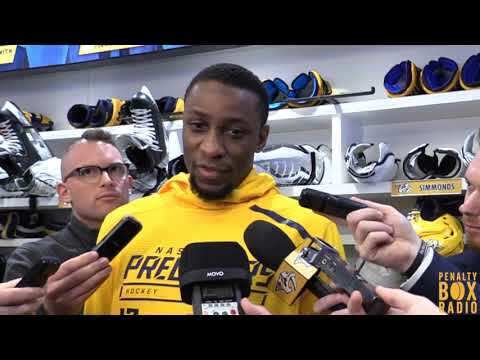 Although the arena was full of red from Chicago Blackhawks fans, the Nashville Predators continued to show their “never quit” attitude and sent the home crowd away with a victory in quite the exciting fashion.